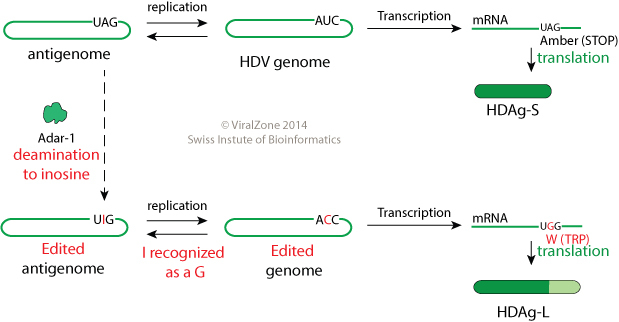 Transcription events: The editing of HDV RNA consists of the replacement of one single nucleotide (A to I) that occurs post-transcriptionally on HDV antigenomic RNA . This modification results in a transcriptional readthrough and production of the large delta antigen HDAg-L, since a tryptophan replaces an amber (STOP) codon in the sequence. Cellular double-stranded RNA adenosine deaminase 1 (ADAR1) carries out this change in the antigenomic RNA , and it requires the secondary structure of HDV antigenome. The edited antigenomic RNA is not infectious.